A 70-years-old man presented with weight loss. He reported heavy smoking and consumption of 2 units of alcohol per day. A thoracic and abdominal computed tomography was performed and revealed cephalic pancreatic enlargement with multiple calcifications scattered throughout the pancreas, a hypodense mass in the uncinated process and irregularly dilated main pancreatic duct. 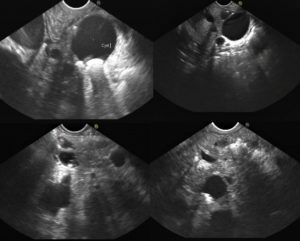 Figure 1 – EUS showed multiple diffuse infracentimetric pancreatic cysts communicating with the main pancreatic duct, with small foci of mural calcification. Endoscopic ultrasound-guided fine-needle-aspiration using a 22Gneedle of the largest cyst was performed with drainage of viscous fluid positive for mucin stain. Cytology was negative for malignancy and cyst fluid analysis revealed elevated amylase and CEA, consistent with multifocal branch-duct intraductal papillary mucinous neoplasms (IPMN) with psammomatouscalcifications. Although relatively rare, cystic lesions of the pancreas are considered to be an increasingly important category with a spectrum of histology and malignant potential1. IPMN are detected with increasing frequency as more patients are exposed to radiologic imaging modalities2. Calcifications within IPMN have been reported, with a frequency ranging from 10% to 25%, however its significance is still unknown2. They are usually focal and peripheral3.Punctate calcification have been seen in approximately 90% of cases, whereas coarse and eggshell calcification have been less commonly described2,3. The presence of punctate calcification has not been associated with malignancy, however coarse calcifications have been associated with malignancy in some cohorts2,3. The most likely explanations for the calcification in IPMN are presence of thick mucin, which has a propensity to build up calcium salt deposits, and coexisting chronic calcifying pancreatitis2.